International mental health watchdog Citizens Commission on Human Rights, established in 1969 by the Church of Scientology and eminent psychiatrist, Prof. Thomas Szasz, warns parents to be alert to their teen-aged children being illicitly sold the stimulant Adderall in light of recent statements by neurologist, Don Gervais, that abuse can “lead to progressive and early drug induced Parkinsonism,” and that the effects on the brain are similar to taking meth. Many people are prescribed Adderall and then sell it for profit, according to neurologist Dr. Don Gervais. He says the effects on the brain are similar to taking meth. Citizens Commission on Human Rights (CCHR), established in 1969 by the Church of Scientology and eminent psychiatrist, Prof. Thomas Szasz, warns parents to be alert to their teen-aged children being illicitly sold the stimulant Adderall (amphetamine and dextroamphetamine) in light of Louisiana neurologist, Don Gervais recent statement that abuse can “lead to progressive and early drug induced Parkinsonism.” Many people are prescribed the drug and then sell it for profit, according to Dr. Gervais. He says the effects on the brain are similar to taking meth. CCHR points out that the U.S. Drug Enforcement Administration also categorizes Adderall in the same class as highly addictive substances, such as cocaine, morphine and opium. 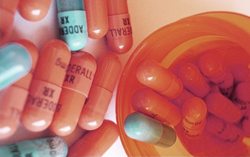 According to a FOX News report, the use and abuse of Adderall is prevalent on high school and college campuses, but the short- and long-term risks of using the prescription drug are still unknown to many. Meanwhile, a study released in February 2015 from the Johns Hopkins Bloomberg School of Public Health shows that incidences of misuse and emergency room visits related to Adderall also increased dramatically for young adults between 2006 and 2011. CCHR was contacted by one Los Angeles grandfather, Mr. Luis, whose two school-aged grandchildren were put at risk of being prescribed Adderall when their mother was told both had “ADHD.” Googling for information about ADHD, he and his daughter found CCHR’s website and its Parents Know Your Rights page and CCHR’s Psychiatric Drug Side Effects Searchable Database. “We discovered we were not the only ones with this concern,” Mr. Luis stated. The Luis family is one example of the scores of parents contacting CCHR to obtain facts about what has become a $9.9 billion a year in drug sales ADHD industry because they are not obtaining the information through prescribers. According to the IMS Vector One database, in 2013, 62,843 0-5 year olds were taking Adderall (or a generic version of it). Court expert, Dr. Toby Watson, PsyD., says, “Psychological and psychiatric diagnosis are unlike any true medical diagnosis found in the lab or with real tissue and medical evidence.…There are no biological tests, scans or lab [work] done.” Rather, psychiatric diagnoses are created by a consensus of a mental health group. A PR Newswire about an analysis from business intelligence provider GBI Research reviewing the ADHD market in June 2015, said, “While marketed therapies treat ADHD symptoms, they are not curative; fundamental causes of the disease remain unknown.” Yet, there are 68 “therapies” currently being developed to treat ADHD. Already coming off the pipeline is the chewable tablet form of extended-release methylphenidate (called QuilliChew ER), which was approved by the FDA in December 2015 for children aged 6 years and older. Mr. Luis is concerned that the more stimulants get approved by the FDA, the more the risk is of children and teenagers also abusing them. Because Adderall and other stimulants are prescription drugs, students misleadingly think they are not dangerous at all. But DeAnsin Parker, a New York City clinical neuropsychologist, says that when people try to stop using ADHD drugs, they may experience extreme mood swings and behave strangely or unpredictably. The symptoms are “all the things that we see if someone were getting off a cocaine addiction,” Parker stated. This is information the Los Angeles family was never given and it took research and looking for non-harmful medical alternatives to psychiatric labels and drugs to ensure the grandchildren were never drugged. As a public information mental health rights group, CCHR provides parents with facts from which they can make informed decisions about their health care and behavioral needs. “Adderall abuse linked to heart disease, Parkinson's,” Fox 8 News, 19 Feb 2016, fox8live.com/story/31269203/adderall-abuse-linked-to-heart-disease-parkinsons. Drug Fact Sheet, Amphetamines, Drug Enforcement Agency, dea.gov/druginfo/drug_data_sheets/Amphetamines.pdf; deadiversion.usdoj.gov/schedules/; dea.gov/druginfo/ds.shtml. IMS, Vector One: National (VONA) and Total Patient Tracker (TPT) Database, Years 2008-2013, Extracted 2014, cchrint.org/psychiatric-drugs/stimulantsideeffects/adderallsideeffects/people-taking-adderall/. “What is attention-deficit hyperactivity disorder (ADHD)?” J. Child Neur. 2005 Dec;20(12):994-1002, ncbi.nlm.nih.gov/pubmed/16417850. “Subjective Diagnosis and Limitations to Psychiatric Diagnosis,” Dr. Toby Watson, drtobywatson.com/diagnosis.html. “Treatment Market Value for Attention-Deficit Hyperactivity Disorder to Exceed $13 Billion by 2020,” PR Newswire, June 12, 2015, prnewswire.com/news-releases/treatment-market-value-for-attention-deficit-hyperactivity-disorder-to-exceed-13-billion-by-2020-507101171.html. Arianna Yanes, “Just say yes? The rise of 'study drugs' in college,” CNN, April 18, 2014, cnn.com/2014/04/17/health/adderall-college-students/. Amanda Leigh Mascarelli, “‘Study drugs’ can be dangerous, Misusing prescription drugs to improve school performance isn’t just dangerous. It’s cheating.” Science News, Society for Science, October 25, 2013, student.societyforscience.org/article/study-drugs-can-be-dangerous.